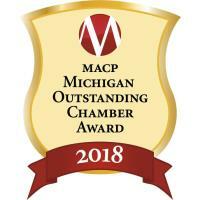 LANSING, MI– The Michigan Association of Chamber Professionals (MACP) recognized the Cheboygan Area Chamber of Commerce with the 2018 Outstanding Chamber of Commerce Award—Small Chamber Category at the MACP Leadership Conference & Annual Meeting held at the Flint Institute of Arts on October 18. The Outstanding Chamber of Commerce award is presented to chambers organizations based on a comprehensive application modeled after the US Chamber of Commerce Accreditation process for recognizing best industry practices. Applications are judged by chamber professionals from across the country and must demonstrate quality, innovation, and effectiveness of programming. The highest scoring applications receive the annual award. Other recipients from the event included the Petoskey Regional Chamber of Commerce (mid-size category) and the Michigan West Coast Chamber of Commerce (large category). The Michigan Association of Chamber Professionals is the industry association for over 300 chambers in Michigan. Its mission is to build excellence in chambers of commerce through organizational and board-level resource support, professional development for chamber staff and to promote the importance of chambers of commerce across the state.